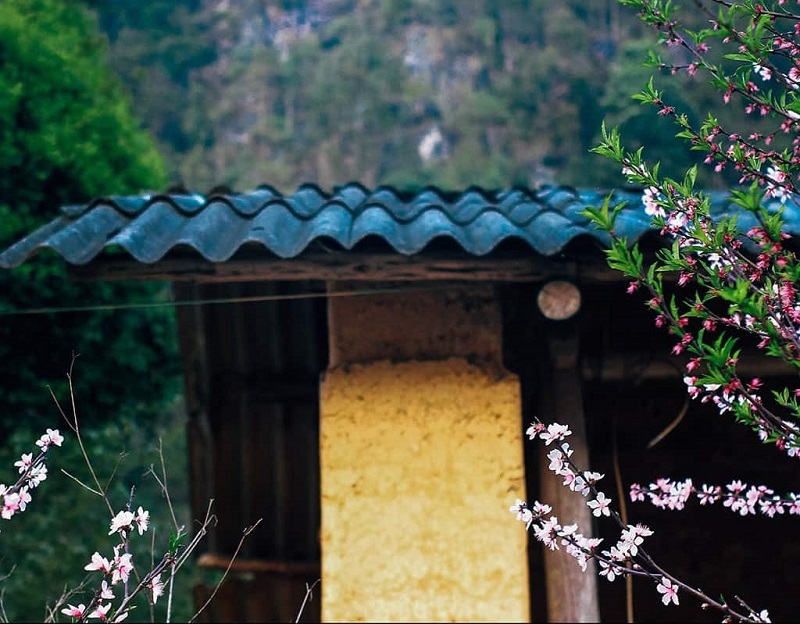 300 kilometers away from Hanoi, Ha Giang is the furthermost province in the North of Vietnam. No dust, no smoke, and no noise, this tranquil land is only comprised of magnificent scenery, challenging mountain passes, and hearty local food. When you come here during buckwheat season which normally occurs from the middle of November to December, the exquisite view will leave you speechless. Since the province is huge, an itinerary is necessary. The Ha Giang four-day itinerary below is a typical yet detailed one that can help you discover this land, so enjoy! Since Ha Giang is pretty far away from Hanoi, the most common way to get to it is by sleeper bus. There are different kinds of buses in My Dinh bus station that start from the day go until night, but I recommend choosing the night bus on the way there. You can sleep, save money from staying in a hotel overnight, and when you get to Ha Giang in the morning, you can begin your adventure right away. Some buses arrive in Ha Giang early, around 4:30 AM to 5 AM but don’t worry, you can stay on the bus until the sun rises. A good journey starts with good food. My ultimate breakfast dish in Ha Giang city is banh cuon trung (egg steamed rice rolls) at 100 Nguyen Trai street. Unlike typical steamed rice rolls that are eaten with pork sausage, pork pie, or batter-dipped shrimp patties, the egg rolls in Ha Giang goes best with a bowl of soup made from pork broth, Vietnamese spices, and sausages. Nibble the incredibly soft egg rolls, munch the scrumptious sausages, then sip a spoonful of the pleasing soup. It will leave you speechless among the chatter of adventure. And don’t forget to hire a good bike, because it is the key to the quality of your journey. Your first stop today is the zero-kilometer mark in Ha Giang city which was built as a check-in spot for travelers. Different from typical markers in Vietnam, this marker is really big and fully made of granite. It is around three kilometers from the bus station, which takes you around ten minutes to find. But if you’re not a fan of check-ins, you can skip this place. Next, let’s get to Co Tien mountain, the most unique and imaginative mountain in this province. It is located in Quan Ba district, about 50 kilometers from Ha Giang city. Nearby is the Heaven Gate, 1,500 meters above sea level. 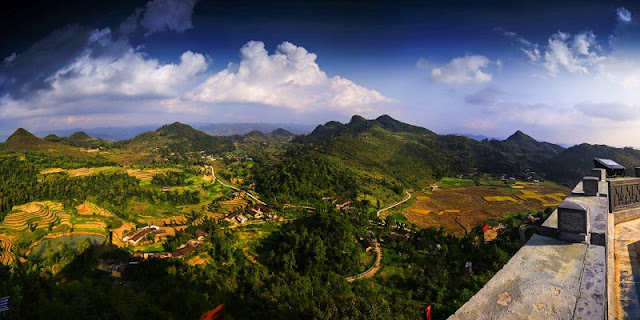 It is totally worth 15 minutes to reach the peak where you can easily view a 360-degree window of Ha Giang. At the foot of the gate, there is a coffee shop that faces the mountains, and I guarantee that their milk Lipton and coffee are superb. Enjoy your drink while admiring the beauty of this land. On the way to Yen Minh district, don’t forget to follow the loops and stop by Lung Khuy cave which is believed to be the most beautiful cave in the North of Vietnam. Yen Minh pine forest, 50 kilometers away from Quan Ba district, is also worth your visit. This is a great place for you to have a picnic, sightsee, or do nothing and just relax. After half a day observing nature, it’s time for us to broaden our horizons about the local culture. Located deep in Sung La Valley, Pao’s house is a stunning attraction that helps travelers understand the ethnic customs and traditions. Featured in the well-known movie Pao’s story, it encompasses every detail of a typical Mong house, from the wood doors to the stone roofs. The entrance fee is 10,000 VND (0.4 USD), incredibly cheap for gaining new knowledge. If you have enough time, remember to visit Pho Bang, the Overslept Town. I believe the nickname came from the serenity, calmness, and tranquility of it. Time doesn’t seem to affect this place, and everything remains frozen in memory. Moreover, on both sides of the street, there are magnificent red roses. They remind me of a sleeping beauty waiting for someone to wake her up. In this case, maybe she is waiting for you! Eventually, here comes our final stop, Dong Van town. 40 kilometers from Yen Minh district, the town makes for a distinctive experience. It is more energetic with the sounds of people selling and buying, or the noise of cattle. If you don’t know where to stay, try Bui Homestay of which the design is very close to the traditional houses of the ethnic minorities – house on stilts. At night, stroll around the town and you will find different delicacies, from the au tau porridge to the hearty thang den or the extreme thang co. If you have enough room in your stomach, you should try them all! Get your gears running by stopping by a local food spot. Normally, people love banh cuon (steamed rice rolls), pho, or noodles for breakfast. If you arrive here on weekends, lucky you! This is when the Sa Phin flea market, selling hundreds of local goods, opens in the morning. Just stop by a random food stall in the market and let the local flavor satisfy your taste buds. But if you don’t come here on weekends, don’t worry. A well-known food store in the Old town is banh cuon Ba Ha, located on Pho Co street. Served with a bowl of soup, the egg steamed rice rolls here taste unbelievable. They are soft, mushy, and buttery. Dip with a little bit of fish sauce and you need nothing more for a glorious day. After breakfast, don’t hesitate to check out the Meo King Palace which used to be the house of a Hmong king. To make the building, it cost around 150 billion Vietnam Dong (64,500 USD). Learn about the structure and the ways in which the workers built the house. In the Vietnamese backpacker community, it is believed that if you visit four points, the Fansipan mountain peak, and the Indochina conjunction, you have conquered Vietnam. On the way to Lung Cu flag point, a monument to mark the furthermost point of the country, you can see big fields of buckwheat flowers. The point consists of a 30-meter tall tower on the summit of the over-1,400-meter Lung Cu peak. The monument was built to mark the northernmost point in Vietnam, although the farthest northern point on the Chinese-Vietnamese border is actually located over three kilometers farther north. At the top of the tower hangs a Vietnamese flag. Enjoy the surrounding scenery and the cool fresh air. At noon, it’s time to return to the town and eat until you burst. Next, let’s head to Ma Pi Leng, the king of all the mountain passes in Vietnam. Believe me, words cannot describe how stunning and marvelous it is. The 30-kilometer pass will let you discover numerous winding trails, breathtaking scenery, and Nho Que, the most alluring river you will have ever seen. You will get to Meo Vac town before evening, rest here. If you don’t know where to stay, read this article. Auberge de MeoVac and Lo Lo Homestay are my suggestions. At night, you can try the local dishes which are only a few steps away. If you prefer motorbiking, just finish the rest of the loop which takes a little bit longer. 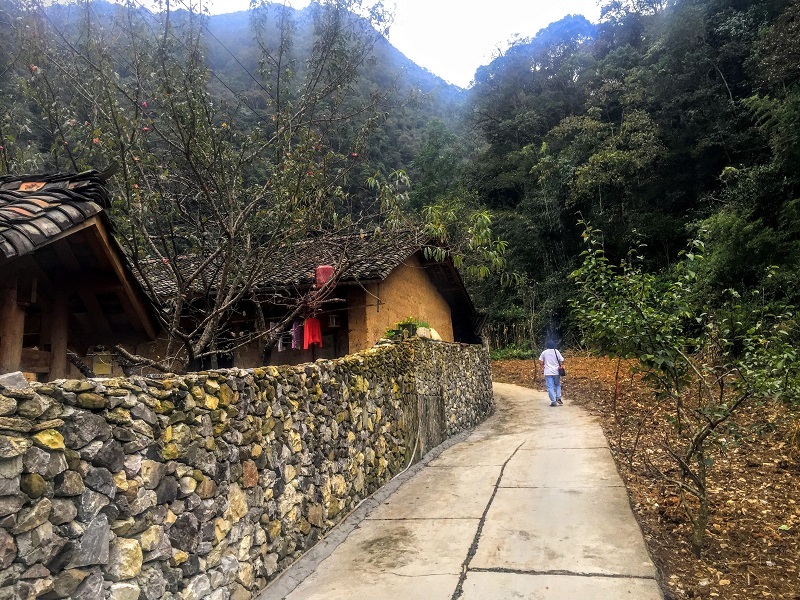 But my recommendation is to head to Mau Dau, return to Quan Ba and follow the road from Yen Minh to Ha Giang that you took on the first day since this saves you a little bit of time. On the way back, you should stop by Lung Tam co-operative society to learn about the local weaving village or Ha Giang museum where you can broaden your horizons about the history, culture, and tradition of the people here. 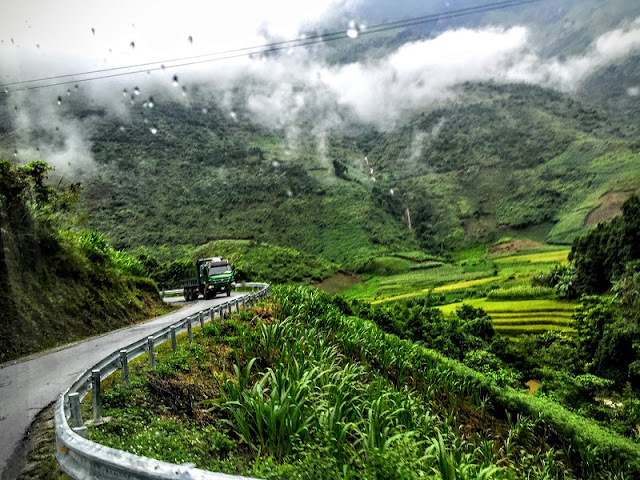 In the evening, get on the sleeper bus and it will drop you off at the bus station in the next morning, ending four fantastic days in Ha Giang. I hope this article gave you some information about Ha Giang. Follow our Sapa Trekking Tours for access to information about tourism in Ha Giang as well as the whole of Vietnam.